I've been in a sock fever these last few days. I started knitting them on Saturday and since then the pile of finished little socks has been growing. They are just so much fun to knit. They are very easy to do, I can binge-watch TV series - it takes about one episode per sock and they are an excellent way to use up all my left over yarn. They use so little yarn that I can use even the shortest bit of yarn. I knit them in two different sizes. The smaller ones start with 16 stitches, the bigger ones with 20 stitches. I actually prefer the bigger ones, they turn out more even and I think, they will be better suited for what I am making them for. On the whole I plan to knit 48 socks and I have about 50 days left to get them done. I want to use them for two new advent's calendars. 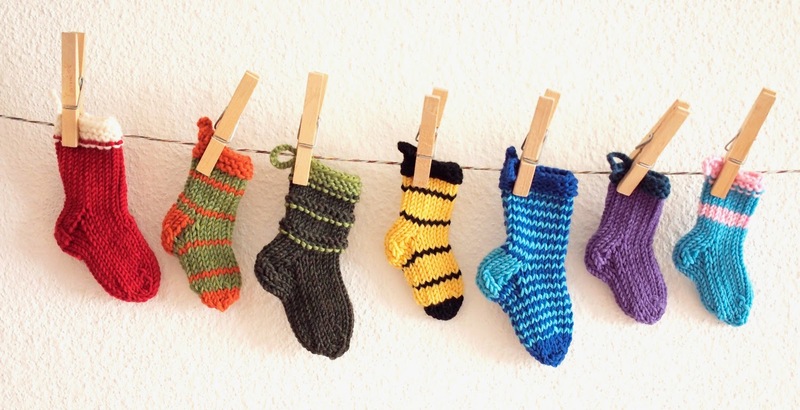 On the first of December, I will put them on a washing line and fill them with little treats and chocolate. thank you - I think they are really fun. I love almost everything about them, only the sewing in of the threads at the end is a bit of a bummer ;-). I knit a few more today and now I have already 13 socks done. oh my gosh, those are so cute, and what a great idea for Christmas! Love it. You would also get some interesting variation by using different weights of yarn, which adds to the fun. They are so super cute, especially all lined up like that! I might use some other left over yarn, but there was so much of this after I knit a whole blanket that I wanted to work with the Merino+ first. But it's a good idea to use variations. Thank you! It's getting harder to keep the sock knitting a secret but I am pretty sure they will like the surprise and the chocolate I will put in it. They aren't so small anymore (both of them 11) but they like stuff like this. They helped me with the leaf garland tonight and now my daughter is planning to decorate our whole appartement and wants to make another garland for her dad.